I guess you know I’m not a “real” old-school Science Fiction person – “real” Science Fiction people can make it through H.P. Lovecraft. I can’t. I’ve tried. It’s not his labyrinthine sentence structure and 19th century word choices – I’ve read a lot of 19th century British and American lit; I can deal with that. It’s just that I find his intense, twisted, and morbid work a little hysterical, gruelingly dark, and at the end of the day, I don’t find that style of dramatic, gimmicky horror compelling. I get bored. What I like are books with a hint of Lovecraftian style — novels that leaven Lovecraft’s weighty Gothic sensibilities with just enough quirk to let us know it doesn’t take itself too seriously. This novel is one of the best examples of the Lovecraftian I’ve read – and one of the few with a young adult protagonist. While not technically marketed to YA perhaps, I think this crosses over beautifully and am calling it early – this one needs to be a Cybils nominee. Summary: Harrison Harrison – H², as his mother calls him – is the fifth male of that name in his family – H²5. 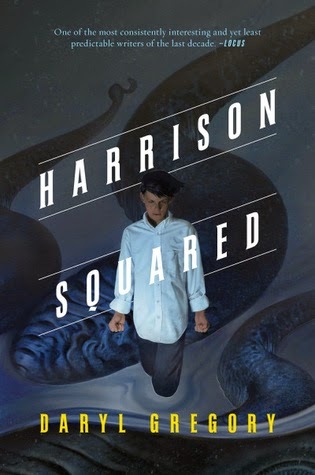 Harrison the Fourth was killed in the accident that lost H²5 his leg when he was just a toddler and their boat overturned somewhere on the California coast, and from that accident, Harrison remembers… tentacles. And rings of pointy teeth. That’s entirely wrong, of course. A piece of metal practically sheered off Harrison’s leg, there aren’t any toothy, tentacled monsters in California, regardless of what he remembers…and regardless of the lingering terror of water which it seems will haunt him for the rest of his life. Aside from an irascible grandfather and an incredibly flighty aunt, most of H²’s family is in Brazil and his mother is all he has left. When she’s in Absentminded Professor Mode, which is most of the time lately, he fends for himself, which is why he’s come along to Massachusetts on her latest research venture. Harrison and his mother are trucking across country to the grim little Northeast coastal village of Dunnsmouth, because there have been sightings of something ginormous in the water – possibly a giant squid. Dr. Harrison’s just going to set out buoys at certain GPS coordinates, buoys which will ping back information to the computers at the research center in San Diego. Only, Harrison isn’t feeling like Dunnsmouth is an entirely healthy place. The kids in the junior class all look the same – pale with dark hair, like an extensive cult of sun-avoiding vampire zombies. The teachers are another lot of weirdies, the villagers scuttle about bearded and gloomy like something out of Melville or The Rime of the Ancient Mariner, and some weird half-fish dude – no, seriously, he was slimy and he had gills – stole Harrison’s comic book. Exactly WHAT is going on in this freaky little town? And, why does his stump hurt here all the time? When Harrison’s mother vanishes – the mysterious little town turns deadly. All Harrison wants is some straight answers and his mother back, – NOW – but it will take heart, determination, and the team of total misfits he’s gathered to help him. You KNOW you want to read an excerpt, so here, have one. Peaks: The obvious WEiRdNeSS in this novel just sells it for me, from the tentacle-festooned cover onward. It spools out from the first scenes like a fisherman’s line, hooks the reader, and drags them seamlessly beneath waves of odd. Strange, strange people – with descriptions that liken them to sea life – descriptions of the grayish little town with its clammy weather, depressing architecture and utterly bizarre school. I loved this dry humor, the references to Dr. Harrison’s Terena ancestry and H²5’s biracial Presbyterian-Terena ancestry (according to Harrison, “like ‘eggshell’ and ‘ivory,’ ‘Presbyterian’ is a particular shade of pale”) being cause for concern in the very white, very backwards village – an oppositional poke to H.P. Lovecraft’s blindly virulent racism – and how in general racists become a little joke poked at repeatedly. It’s interesting how Harrison’s fatal flaw – a rotten temper – works for him and against him. He’s truly a take charge of things in his own life, and makes them work kind of character. Harrison’s voice is confiding, snarky and bewildered by turns. He’s slightly delusional in the beginning of the novel, but unlike many YA heroes, he’s never self-deceiving. I love him as a character because he KNOWS there’s stuff going down in Dunnsmouth, and he’s not afraid to look at it and find out. Also, because he’s hilarious. To wit: “Mom once said Selma wasn’t a woman but an ad in a women’s magazine: glossy, two-dimensional and smelling like a perfume insert.” Snark! The zingers are a great deal of fun, even the dumb science jokes and the manga references. Each chapter begins with a piece of Coleridge’s “The Rime of the Ancient Mariner,” which is another lovely thing that will make readers feel smart – especially if you were a reader assigned this for school and never enjoyed it before – you will now! All together, this novel is sheer enjoyment. Valleys: This is only a valley to ME, but this book is actually a prequel to an adult novel, WE ARE ALL COMPLETELY FINE. If we all buy this book, maybe we can talk the author into writing more for YA? It’s worth a shot, isn’t it? This novel has a messy ending – no shiny bluebirds flying around the HEA, but a grimly determined monster hunter, having been tried in the fire, stands ready to use the power of science to make things right… which is a good thing, since evil never sleeps… Frankly, I want more of KID Harrison, not adult Jameson Jameson, who is apparently Harrison under a pseudonym. This also makes me want to pick up WE ARE ALL COMPLETELY FINE, which I can’t guarantee is a YA crossover but will undoubtedly be interesting! Conclusion: You know I am a wuss about horror, yet I cannot properly convey to you the charm of this book, which is …kinda horror. Just pick up a copy. This is a great book for anyone who loves adventure and horror-lite, and is a quick, engaging read that will leave you craving more. I received my copy of this book courtesy of Tor. After March 24th you can find HARRISON SQUARED by Daryl Gregory at an online e-tailer, or at a real life, independent bookstore near you! Graphic Novels… more graphic than usual?